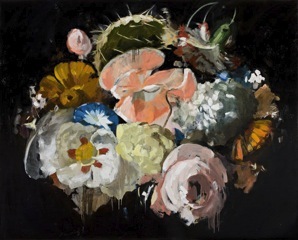 There’s a real lusciousness in Morgan Allender’s large oils; in the stickiness of glazes and dripping paint, in their vivid coloration, the lushness of the flowers, the depth of the blacks and in their rare air of solitude. In this world where sadness is clinicalised and solitude can feel illicit, her richly evocative paintings invoking drifting emotions and shifting states of mind offer this luxury. It is this contemplative solitude as a kind of necessary sadness that Allender talks of and that pervades her work inviting the viewer into these dreamlike spaces of interior reflection. She resists too close dissection of possible meanings, for her painting is very much a sensuous response to her surroundings while also exploring the idea of landscape as embodied force. 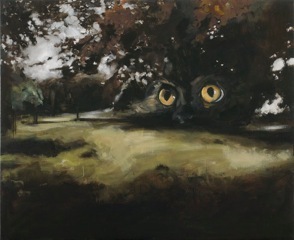 An earlier series Landscape Lost (2007) floated watchful animal faces above the landscape, a literalisation of the landscape’s anima. 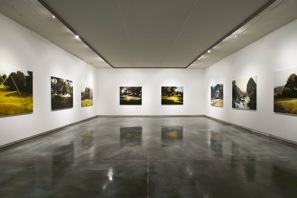 Allender works with both the rigorous geometries of the classical landscape tradition and the complexities of Dutch flower and vanitas painting deftly balancing order and chaos in the loose gestural lushness of the brushwork, the subtlety of veiling glazes, paint runnels and the controlled ordering of the picture space creating works richly imbued with a sense of both foreboding and calm. 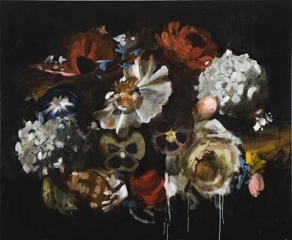 In the series Realm (2008), overblown flowers cluster in spherical bouquets and falling cascades floating or tumbling across grounds of soft, solid blacks, the tension between cohesion and dissolution palpable. Without needing the vanitas armoury of skulls and hourglasses, the flowers on the cusp of decay suggest all this; the curve of a rose mimics a skill, a starburst of flowers suggests visual lacunae. The darker glazes veil the rich colours of the flowers like twilight or storm light creating an intense mood of loss and longing. 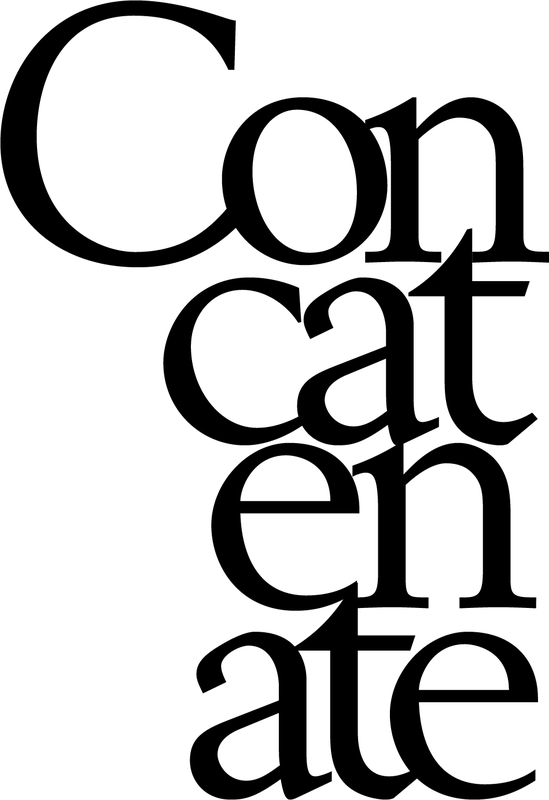 There is, in her most recent series, an edgier feel, a Hitchockian gothic a la Rebecca. Placing these overblown bouquets against indistinct and looming trees and patches of trapped sky, the disjunct between hovering flowers and leaden sky, out of scale and seemingly out of sync give the pictures a hallucinatory feel and sense of immanence. Seeing Allender’s work for the first time this sense of enclosure reminded me of Susan Norrie’s paintings with their dark varnished surfaces and Allender cites Susan Norrie and Undertow (2002) with its air of looming catastrophe as an influence. A cinematic quality reflected in this most recent series with its close up effects and dramatic lighting deepening these brooding florals. As vanitas paintings always brought reminders of death in life, the atmospheric realms of Allender’s paintings offer garden like spaces to move into and through offering respite and an enriched experience of each moment of life.